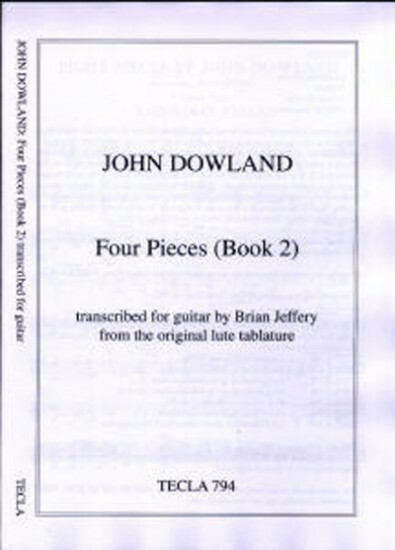 These four pieces were originally composed for the lute, and have here been transcribed for the guitar by Brian Jeffery from the original tablature. The collection was previously published by Oxford University Press and has now been assigned to Tecla Editions. THIS ITEM IS NOW AVAILABLE AGAIN. The solemn ‘Lachrimae Pavane’ is probably the most famous of all pieces ever written for the lute: it is an instrumental version of the song ‘Flow, my tears’ from Dowland’s Second Book of Airs (1600). The Fantasia that follows is remarkable for its use, at the end, of what we call tremolo, and is probably the earliest known example of that technique. It is anonymous in the source, but seems more likely to be by Dowland than by any other lutenist of his day. ‘Fortune my Foe’, based on the popular tune of the same title, may have started life as an accompaniment to that tune, but Dowland’s setting came to be known as a solo piece. ‘Mignarda’ is an instrumental setting of the song ‘Shall I strive’ from Dowland’s Fourth Book of Airs (1612).